Wasn't sure which section to put it in, so apologies if it would have been betterer elsewhere. Very nice!! 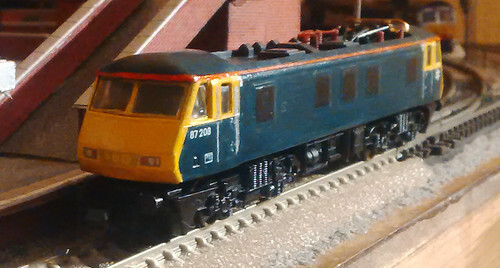 Like the "Fictitious Liveries" website, it's interesting to see what 'Post-BR' locos look like in BR Blue, which I contend was - far from being 'boring' - actually a very smart livery, especially Ex-works. Wonder if it would look better if the yellow around the cab door windows was blue instead??? An easy try. Also thinning the orange stripe would improve the look for sure. Not as easy. Plenty of classes had the yellow wrap around the side windows. Leave it just the way it is. That livery suits the class well! Yeah, the orange stripe came out a bit thicker than I intended. Thanks to Chris at CJM (and Bernard at TPM for pointing me in that direction) she now has a face!